Long gone are the days when I was in high-school and tried too much of nail art and other experiments with my nails. I’ve been regularly visiting nail salons a lot. But now, most of the time my nails are completely free from polish. Maybe, I’ve become aware about saving money or now I prefer a natural lifestyle rather than a fancy one. Frankly speaking, I feel nail salons are not the only way to keep my nails looking nice. I’ve been trying few natural ingredients that work like a charm when it comes to nail health. I believe, natural home remedies to cure and beautify ourselves is always the safer and healthier option. Here are few things that are easily available at your local market and can keep your nails healthy and help them grow better. Flaxseed oil is rich in Omega-3 Fatty Acid. This helps in keeping our nails healthy. Omega-3 acids, along with Vitamin B, Potassium and protein help in growing nails and cures brittle nails & accidental splits. Use a glove to keep the moisture for longer. Try this daily before going to bed. Orange juice contains vitamin C. It helps the healthier formation of collagen thereby making nails healthy. Wash your hands with warm water after, dry up and apply hand cream. Try this for 2 weeks and check results. Olive oil is known for its overall health benefits. It contains vitamin E that helps to improve blood circulation, strengthen nails and aids in steady growth. It is known to be absorbed deep into the skin, and nourish our system. Lemon juice is a natural polisher that adds a shine to your nails. Due to its rich vitamin C content, lemon juice adds strength and moisture to nails, helping them grow steadily. Try this concoction out daily for best results. Coconut oil has numerous benefits. This oil cures splits and helps retain cuticles’ moisture. 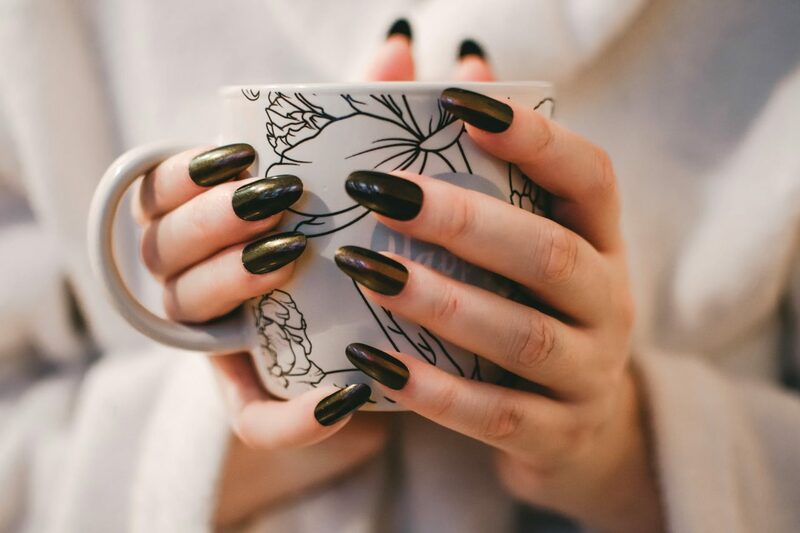 Coconut oil provides strength to the nails, thus helping them stay healthy. Massaging your fingers with coconut oil on a daily basis can provide a natural glossy sheen to the cuticles. This is one of the best winter care remedies. Warm up the concoction till lukewarm. Tomatoes are known to be the cure for many health problems such as blood pressure and constipation. Additionally, biotin in tomatoes cures broken and dry nails. This strengthens the nails, helping it grow steadily. Tomatoes are rich in Vitamin A and C which keeps the cuticles healthy. Wash your hands gently and pat dry. Along with following these natural tips try to keep away from the harmful chemicals. By that I mean nail paint remover and polish themselves. If you want to paint your nail or nail color is your thing try for less harmful organic nail paint like this. Also, you should know when to leave them alone. Biting your nails, picking at them (well I’m guilty of that!) can damage your nails.